Calm, near the largest ski areas. On the side says 'sun' of the Haute Tarentaise, in a small traditional village, opposite the Arcs, beautiful chalet with stunning views south. It has 4 bedrooms 2 bathrooms, 2 toilets. It is perfectly well equipped TV, dishwasher, washing machine, hob microwave) .The stay is glazed with large windows overlooking the Tarentaise, the massive glacier Bellecote, Mont Pourri, the Aiguille Rouge. 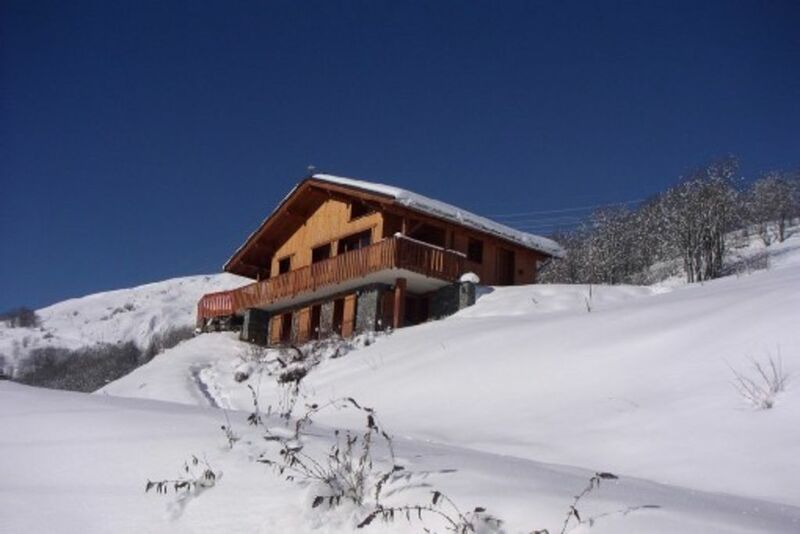 The Chalet is ideally located to benefit from the largest ski areas of Savoie. It is located 10 minutes by car from the funicular that connects Bourg Saint Maurice to the station ARCS. This ski area LA PLAGNE LES ARCS offers 425 kms of varied pistes. For the summer the chalet has its own swimming pool 10m x 5m heated and secured. The land has a surface of 1800 m2. For your comfort and to benefit from a smooth flow and a more quiet day for skiing on Saturday. Rentals in high season can be Sunday 10am to Sunday 16h. For relaxation, the price includes a package 'Bed linen, beds made, cleaning end of stay and first breakfast ingredients. Two bathrooms, one controlled by a room. The bathrooms have a bath. Flat screen TV, microwave, ceramic hob, DVD player, dishwasher, washing machine ... For summer cottage has its own 10m x 5m swimming pool. the pool is heated by a heat pump. It is secured with alarm and regulatory area enclosed by a fence. Domaines skiables exceptionnels à proximité. A conseiller et à refaire. Séjour très agréable dans ce beau chalet confortable, et très bien équipé pour partir entre amis. Cadre excellent. Idéal pour faire de belles randonnées en été. Merci à M.Tacquet et à Mme Flandrin pour leur gentillesse et leur disponibilité. Nous avons passé une agréable semaine au mois d'août dans ce superbe chalet. Perché à 1200m d'altitude la situation est exceptionnelle surtout depuis la piscine. Accueil très sympathique et arrangeant à notre arrivée. Notre semaine de vacances s'est déroulée à merveille au sein de ce magnifique chalet. La vue est belle, et encore plus appréciable lorsque l'on est dans la piscine! Lors de notre arrivée, nous avons très bien été accueillis par Mme F, qui était à notre disposition, merci à elle aussi. Le chalet est très fonctionnel, idéal pour un groupe d'amis comme nous. Très beau chalet adossé à la montagne côté versant du soleil avec une vue imprenable à 180 degrés sur les Arcs , la vallée de Pesey Nancroix , La Plagne et +++ . Nous avons passé un excellent séjour dans cette magnifique région . Location à recommander . Deuxième séjour dans ce chalet. Les bains dans la piscine sont particulièrement savoureux. Merci, votre appréciation nous fait plaisir. Nous faisons en sorte que chaque séjour se déroule au mieux. This is because we have 30 years in the Tarentaise that we chose this place to build our cabin. The view is absolutely stunning, panoramic 180 ° view of the mountains of La Plagne and Les Arcs, perfect exposure because we are on the side of the Sun said thus, even in winter, to benefit from maximum sun. The calm is absolute. You are in the mountains in a small hamlet inhabited all year round. .We Really like skiing, we are 10 minutes drive from the Les Arcs funicular, which is located in Bourg Saint Maurice. For access, the TGV is 7 km to Bourg Saint Maurice. The road is clear in the morning because again we're on the sun side and this side is inhabited by the Savoyards. And we have been the private pool, heated and secure! Golf: The nearest golf is that of Arcs 1800. Ski: For skiing; the choice is really great. The view from the chalet 'kiss' Paradiski; La Plagne + Les Arcs with 425 km of slopes with a variety of incredible scenery on the four expostions. Access is by the funicular Arcs which is 10mnts drive from the cottage. No parking problems or snowy roads. For great skiing, the Espace Killy; Tignes + Val d'Isere. Access is by Tignes-les Brévière which is 30 mnts drive from the cottage.